Not everybody would have left a will in the past, it was usually only those members of society with some standing and wealth. You can search our indexes in the Archives to see if your ancestor was amongst them. We may also be able to supply you with fuller details. Some of the wills have been transcribed in full and are available on request. It can be fascinating to see the types of possessions that were passed down, and certainly gives a glimpse of the lives that people led. 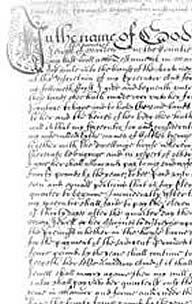 As of June 2008, some 300 Marden wills from 1538 to 1856 have been indexed by members of the History Group and there is an on-going project to make full transcriptions of all the wills in our possession. It is slow and exacting work as the archiac writing, spelling and grammar can be very difficult to decipher. The transcription of wills has been overtaken by more urgent projects, but individual wills will be transcribed on request. Medieval Wills can be found in the archives, all later wills can be found in the Catalogue, within the archives.